The LILB-01 TOPS Little Bugger is a compact, slim profile utility knife, designed by survivalist Matt Graham, that features a 2.38 inch Wharncliffe fixed blade made of 1095 steel, .090 inch thick, with a Rockwell hardness of 56-58, a tumble finish, modified Scandi grind, and a notched thumb rest for secure grip. The Little Bugger Knife has full tang construction for strength; ergonomic tan canvas Micarta scales with finger grooves and a palm swell for secure purchase, contrasting black liners and a lined lanyard hole. A Coyote Tan Kydex sheath with black injection molded J-Clip is included. The TOPS Knives Little Bugger Knife has an overall length of 5.75 inches, and it weighs 2.4 ounces; 3.7 ounces with the sheath. Made in the USA. 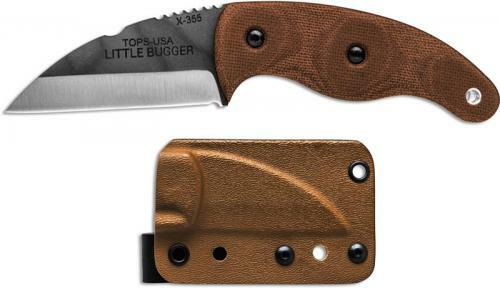 From the TOPS website: The Little Bugger was designed by Matt Graham, who is much more than just a "survivalist". He is an athlete - ultra-marathons, triathlons, rock climbing, etc., a martial artist - several styles, and an expert in primitive weapons, hunting, and shelters. He has more "dirt time" than almost anyone else out there. The reason he designed the little bugger was to have a sharp, full-tang fixed blade that can be carried when everything else is left behind. Imagine running an ultra-marathon with a backpack full of gear and this starts to make sense. In order to meet that need, he designed the little bugger. It's made of 3/32" 1095 steel with thin tan canvas Micarta handles and black liners. The knife weighs in at about 2.4oz. The sheath, also lightweight and minimal weighs less than two, giving you a total package of less than 4oz. The narrow j-clip on the sheath is great for wearing this on a belt or on a pack. It can also be worn with most shorts without falling off. The thin, straight blade is complimented with TOPS' modified Scandi grind, making this knife razor sharp with a proven utility-style blade.